In Canada’s north country snow and ice are the more common obstacles to back country access. At Pioneer we’ve tried a variety of products and have a fleet of the most reliable and stable products in our history. Skidoo, by Bombardier, is the go to machine for almost any application – safe, reliable and easy to operate, these machines are a pleasure to operate. 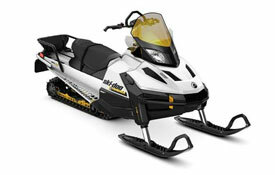 The Skidoo Tundra LT 550 c.c. is a fun, nimble machine for riders that are looking to float through the backcountry with ease. The Tundra is a sled packed with performance, excellent fuel efficiency and perfect for a long day of work or play. Dimensions L: 119" H: 48" W: 41"
Canada’s north country can be challenging and not all of our customers are comfortable on every machine we rent. That's why we provide both in-person and online training on every unit we sell, alongside special safety training that can support our customers no matter what terrain they encounter. Individual online training can be completed at your own pace, or in-person group training can be arranged for a date and location of your convenience. Pioneer makes it our priority to keep our rental fleet the newest in the industry so we occasionally offer some of our well-maintained used equipment for private sale. It's the evolution of our fleet of over 800 offroad vehicles. We offer used sales out of our 6 locations in Edmonton, Grande Prairie, Fort McMurray, Bonnyville, Athabasca, and Fort St. John, BC .